The “Officiating Swimming – Competitive Strokes” videos are the FINA approved tools used for a better understanding of officiating in Swimming. Through this video FINA aims to uniform a pattern of interpretation and application of Swimming rules, thus raising the quality of officials. 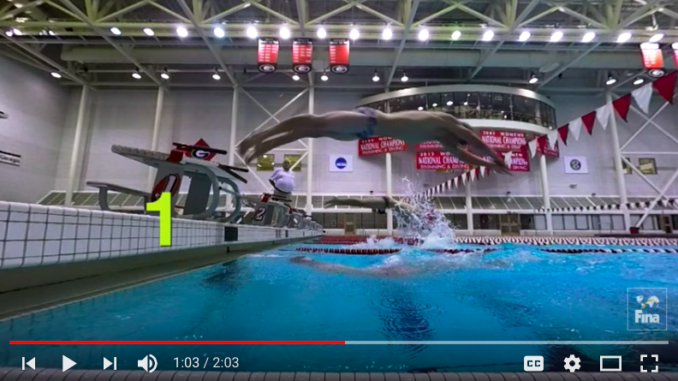 The swimmer on the blocks may be in motion beginning the dive, but must maintain contact with the blocks until the approaching swimmer has touched the wall. To correctly judge the takeover, observe the toes of the departing swimmer: when his/her toes leave the block, immediately drop your eyes to the incoming swimmer to ensure that he/she has touched. If the incoming swimmer has not yet touched, an early takeover has occurred: wait until the completion of the race, then follow the process set for confirmation from the referee prior to informing the team of the disqualification. … where they make “Watch the (1) FEET then the (2) TOUCH” very clear.